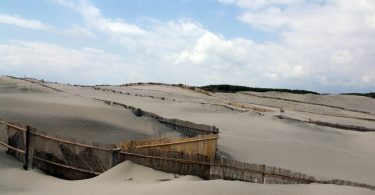 I spent the morning in Hamamatsu City to visit the castle, the Hamamatsu Festival Pavilion and also the nearby sand dunes. 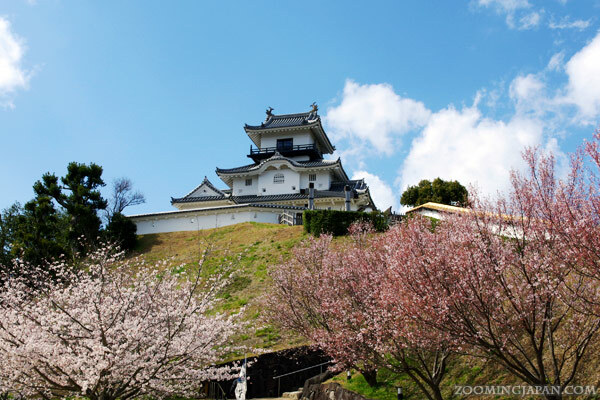 In the afternoon I decided to explore the nearby Kakegawa Castle. 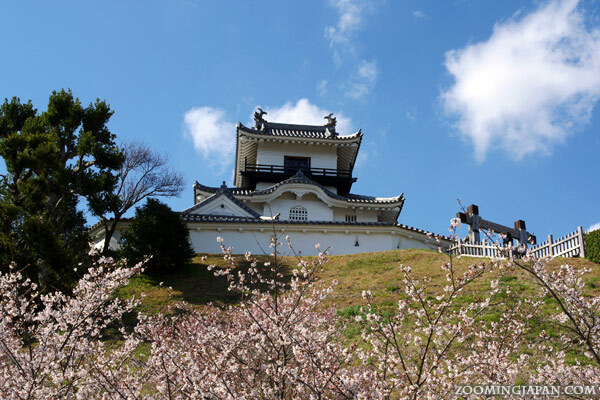 Kakegawa Castle (掛川城) is located in Shizuoka Prefecture (map) and on clear days you can even see the top of Mt. Fuji from there! It’s really easy to get to the castle in a short (10-15 min.) walk from the JR Kakegawa Station. 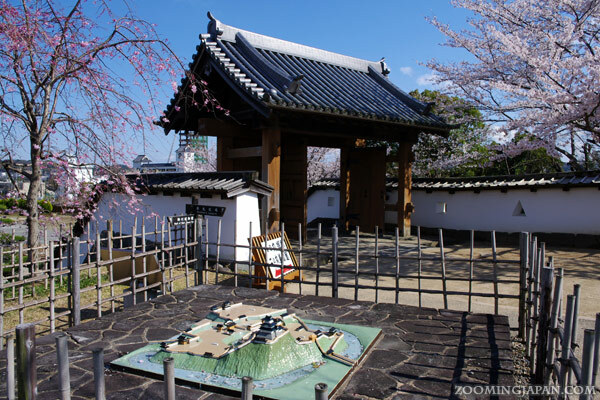 You’ll probably enter through Kakegawa Castle’s Yotsuashimon (Four Legs Gate, 四足門). 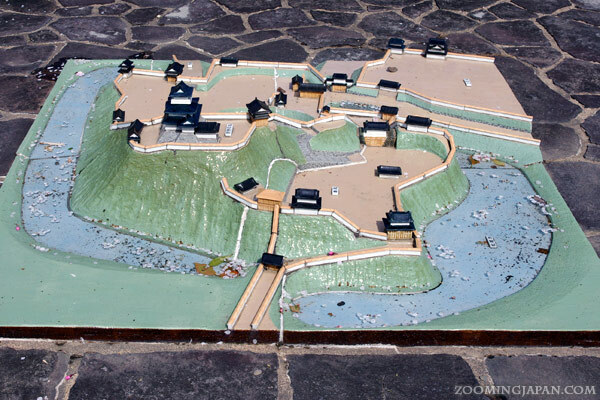 There’s a small model of the original castle grounds right next to the gate. 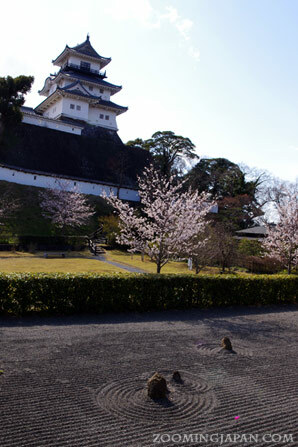 Kakegawa Castle was built about 500 years ago by Yoshitada Imagawa who was the lord governing the area at that time. 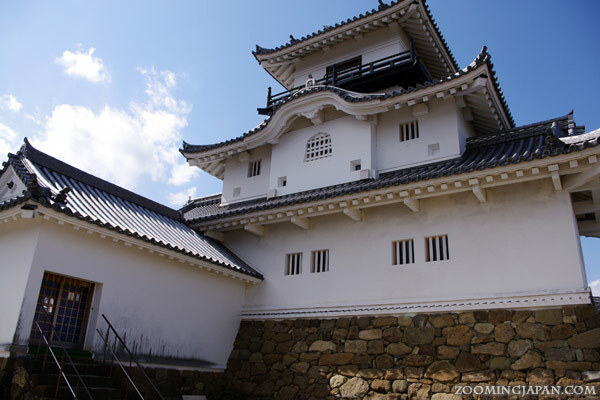 There were a lot of Civil Wars and the Imagawa family gradually lost their power. 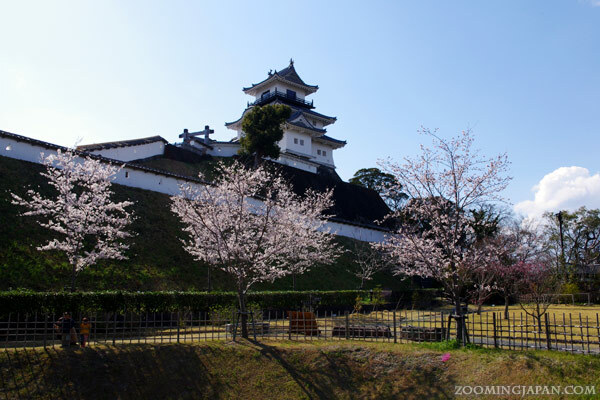 Eventually Katsutoyo Yamauchi, who was a vassal of the Toyotomi clan, became the lord of Kakegawa Castle. 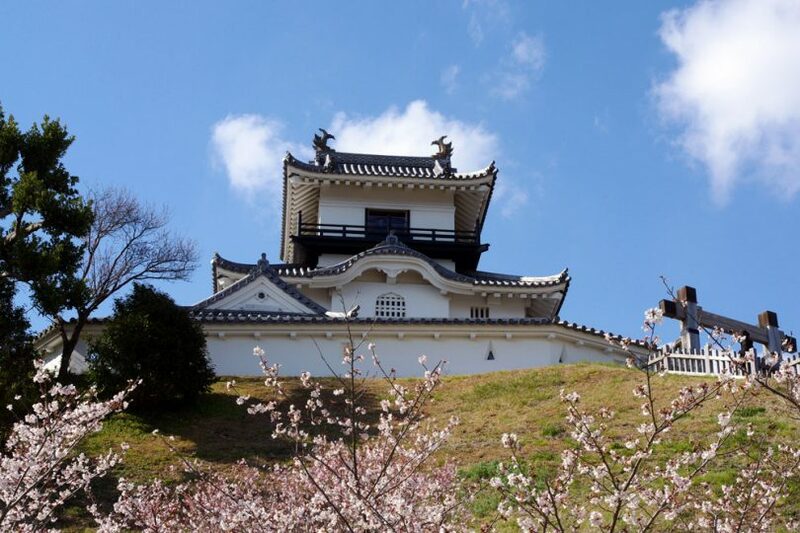 Lord Yamauchi renovated the damaged castle and ordered the construction of the first castle tower of Kakegawa Castle. 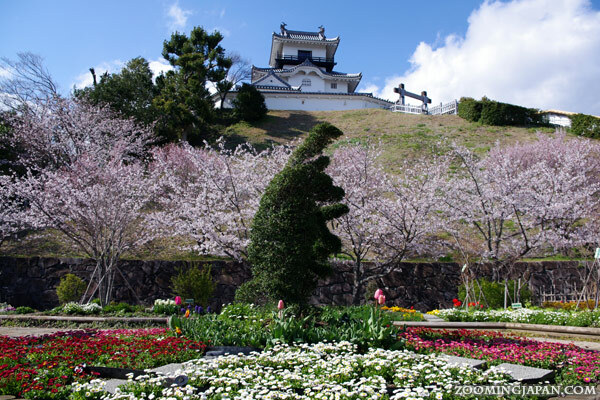 During the Edo period Kakegawa Castle greatly flourished. A big earthquake in 1854 destroyed most of the castle (including the tower) and in 1869 it collapsed completely. The ruins of the castle were used as a park and in 1993 the castle tower was rebuilt. 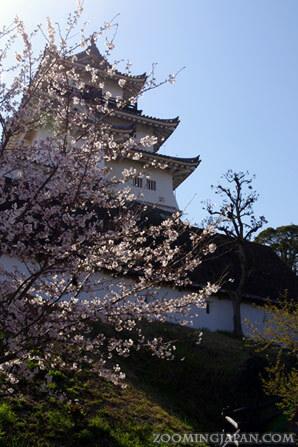 It was the first tower in Japan to be rebuilt with wood. The tower stands nowadays at a height of almost 20m above the ground. From the outside it looks like there are only three levels, but actually there are four stories inside. 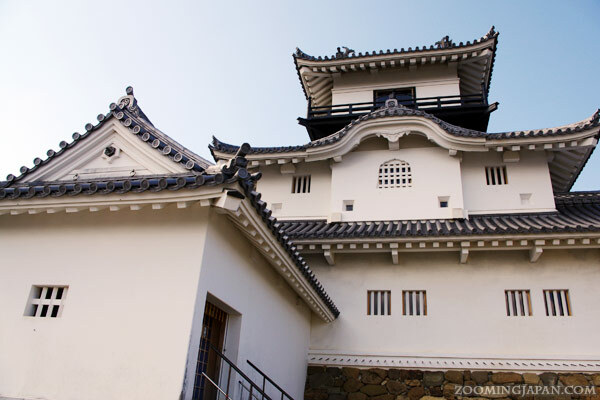 According to the Kakegawa Castle pamphlet some experts say that the castle tower’s white-plastered appearance was modeled after Jurakutei (聚楽第) in Kyoto and the black-laquered balcony and railing after the castle tower of Osaka Castle. 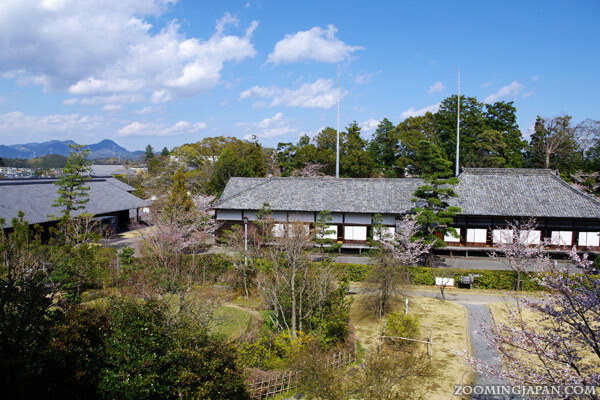 “Karahafu” is what the triangular part of the roof is called – formed by the sloping eaves characteristic of the architecture of those days. 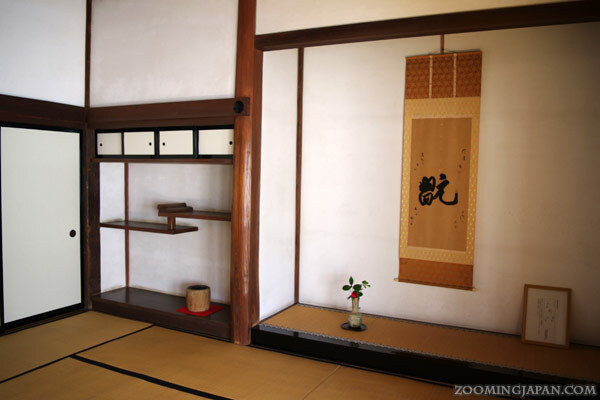 The windows of the 2nd floor are in the “Katomado” style, a window type used in zen temple structures. 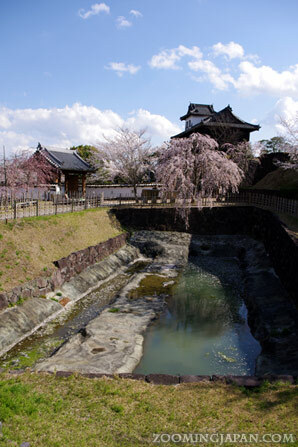 Here you can see the palace “Goten” that was constructed in the latter part of the Edo era. It was the place where official ceremonies were held, but it was also the official residence of the lord. Furthermore it was used as a government office. 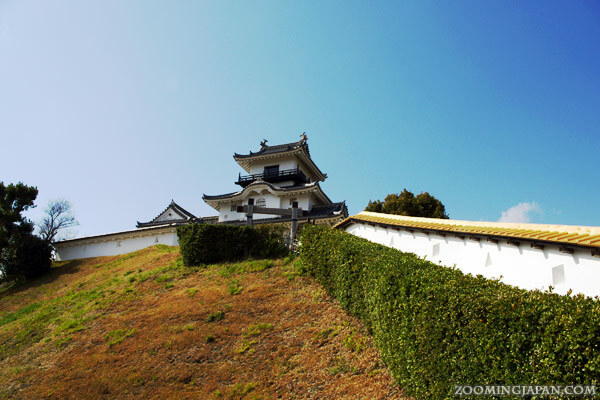 The palace is within the castle grounds and offers a great view of the castle’s main tower. 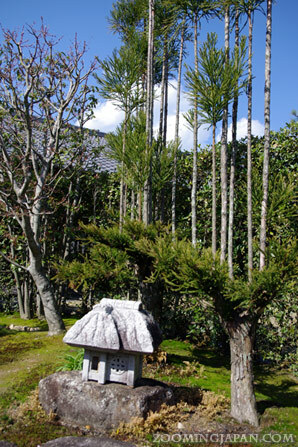 The “Goshoin-kami-no-ma” is where visitors were permitted to meet the lord. It is the central room of the palace. 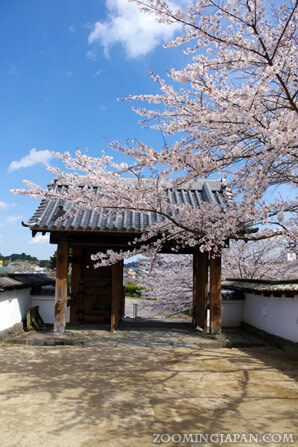 It has a typical Japanese “Tokonoma” (床の間), a special alcove decorated with a hanging scroll (chosen according to the season) and flower arrangements. Inside the palace there’s another detailed model of the former castle buildings. 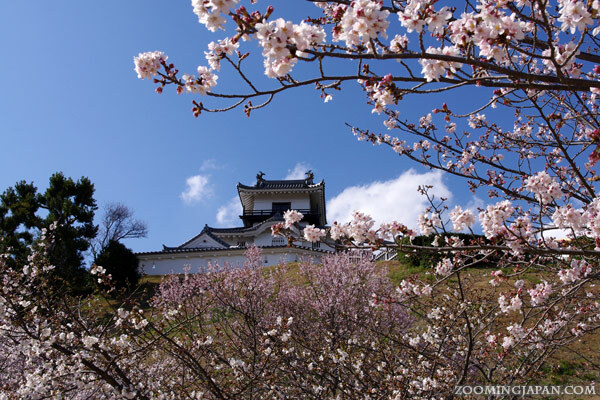 As you can see the weather was extremely beautiful and the cherry blossoms where in full bloom. I enjoyed my stay there a lot! 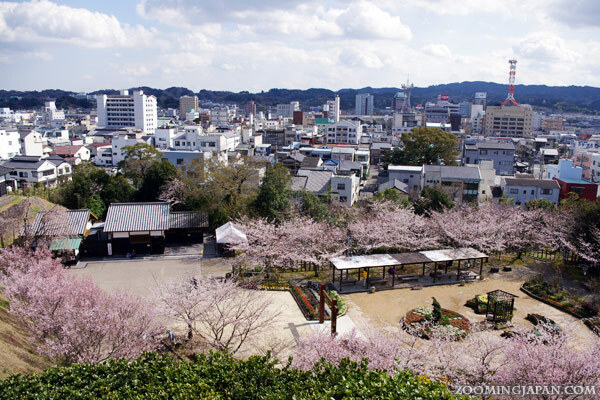 In 2012 the cherry blossoms were not as early as in 2013. 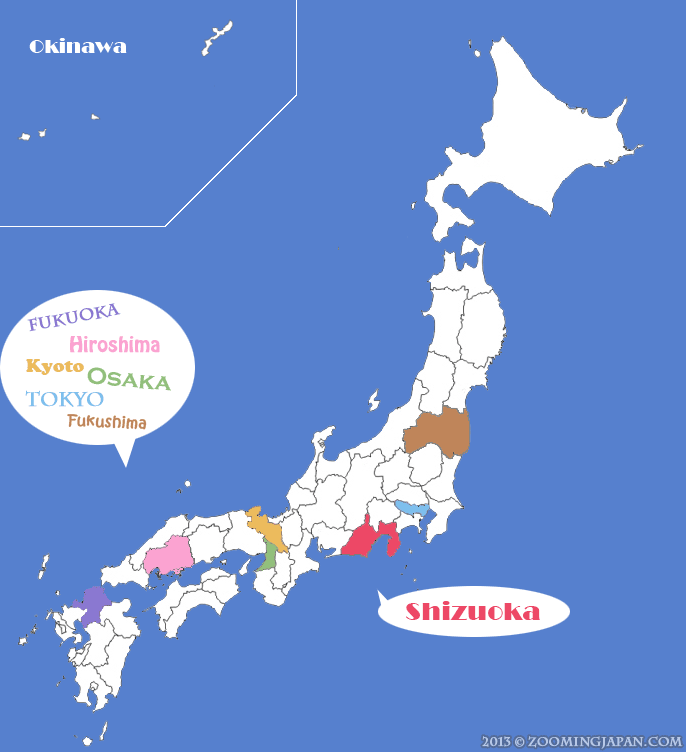 When I went to Chiba and Kanagawa first, there were almost no cherry blossoms yet, but Shizuoka Prefecture is always a bit earlier than Tokyo and surroundings. 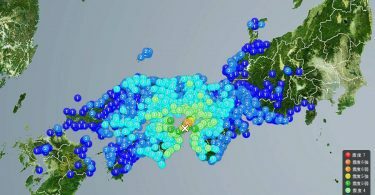 You might want to keep that in mind if you ever travel to the Kanto or Chubu area in early April. The surrounding park is really nice! They have planted so many different trees! 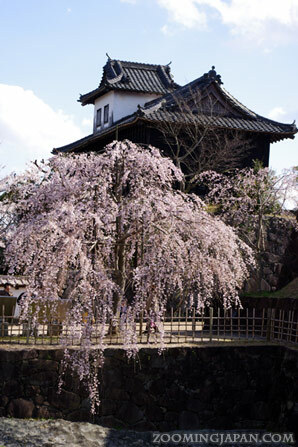 I fell in love with the weeping cherry blossom tree you can see in the photo above. 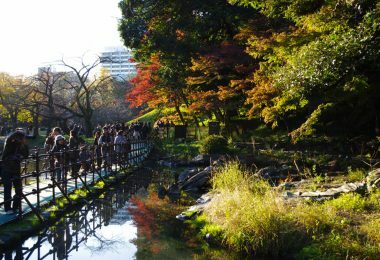 I’m sure that the park will be a blast even if you visit outside of cherry blossom season. The castle tower is rather small and it’s “only” a reconstruction, but because of its location (so close to Mt. Fuji and on a small hill) I really liked it! 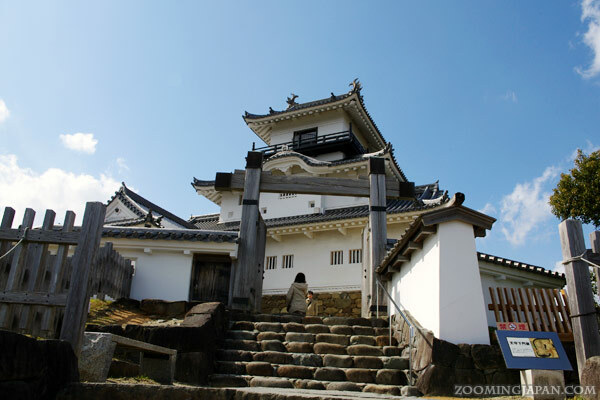 It’s certainly a castle I can recommend visiting if you are in Shizuoka Prefecture. If you are a castle fan, then it’s a must! The castle park is very clean and is regularly taken care of. 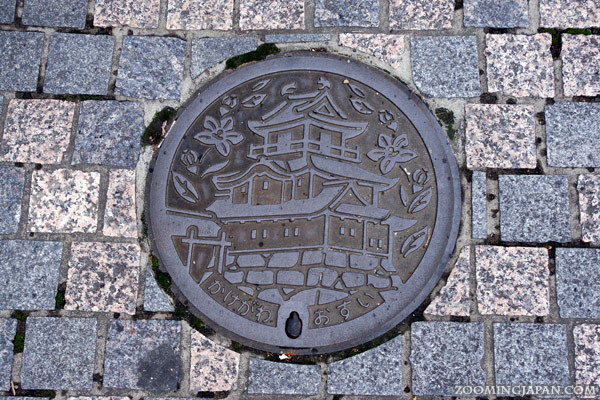 On your way between the JR station and the castle you’ll find these manhole covers that are displaying Kakegawa Castle. 12 mins walk from JR Kakegawa Station. Yes, three castles in one day! Not too bad, huh? I lived in the same block of the current 聚楽第址. I never felt the connection to a defunct historical region until you wrote this post. Japan is such country where in the midst of life, people live under the shadow of past, in a very pleasant reminiscence. That’s a good effort in my book – three castles in one day. 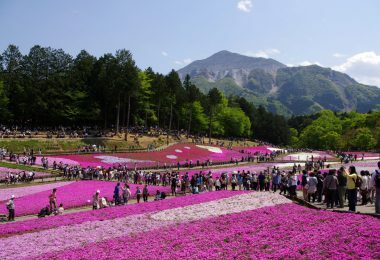 You keep inspiring me further with each post to visit Shizuoka again. 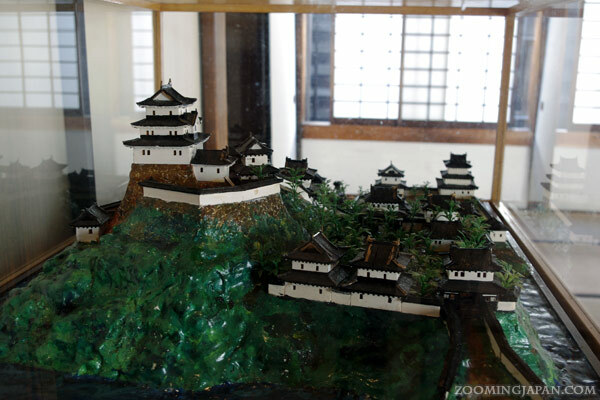 I hear this castle is one of the better reconstructions with the work done with wood rather than concrete. 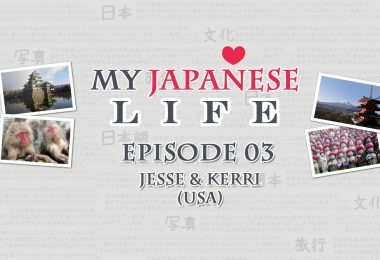 I’m so glad to hear that my posts inspire you to travel there! Yes, you told me about that. I’m really sorry to hear that. Beautiful photos! We have Cherry blossoms here in Atlanta too… Everything is blooming like crazy this time of the year.